“And it doesn’t matter, how much I tell myself, I still feel the same/And it doesn’t matter, it doesn’t matter, ’cause I still feel the same,” Kate Nash opens her third album. An album that has been received by critics and fans alike as eschewing the traditional quirky Kate Nash style in favor of aggressive feminist indie punk rock. 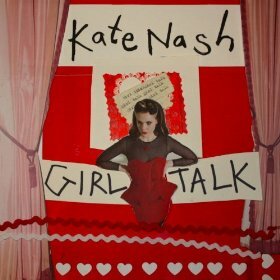 Kate Nash on Girl Talk is like Adele’s younger, more aggressive sister, who picked up a guitar after the heart-wrenching loss of true love. The songs range from the melancholic and desperate sadness of unrequited love and its lasting impression (“Part Heart”) and then the rail against how much effort was expended and essentially wasted to maintain image (“Fri-End?”). The sound, though different from the overall tone of her previous albums, is not a discomforting fit. Nash has the angst to be the front woman for a garage or underground punk band, and the exposure to bring the sound into a more mainstream audience. Her music touches the roots of Liz Phair, by commanding a masculine sound and reappropriating it to empower the silent female in the relationship. Any album about love and relationship though has to include a sweetly disposed single. “Are You There Sweetheart?” is less straightforward testosterone, and more of a painful reminder. “You were my friend,” Nash sings in a quiet whisper over what could be a Pixies-inspired guitar rift, and over a strong pulsing bass. Girl Talk is laced with emotion, from the pejorative sarcasm that mingles with the subdued, but sweet Nash. When she’s suggesting a break (“You don’t come anywhere near me/I’ve got big plans”), they are immediately offset by her longing for a restoration for love. Nash is battling the cliche, while borrowing elements from long-standing, fast and aggressive music. There is a touch of the Violent Femmes, the Pixies, Husker Du; she borrows from a movement that sought out acceptance after a life of tragic banality or tragic travesty, and produces a great album about being tortured by feeling.